CARE School of Engineering offers four years B.E degree program in Mechanical Engineering and two years M.E degree program in Engineering Design with an intake of 120 students and 18 students respectively. It has highly qualified, dedicated and experienced faculty members with specializations in Manufacturing Engineering, Thermal Engineering, Energy Engineering, Engineering Design, CAD/CAM, Industrial Engineering, Mechatronics and Automobile Engineering. The academic activities are well supported by state-of-the-art laboratories. The department has a mix of students with truly diverse background, with a desire to compete globally. 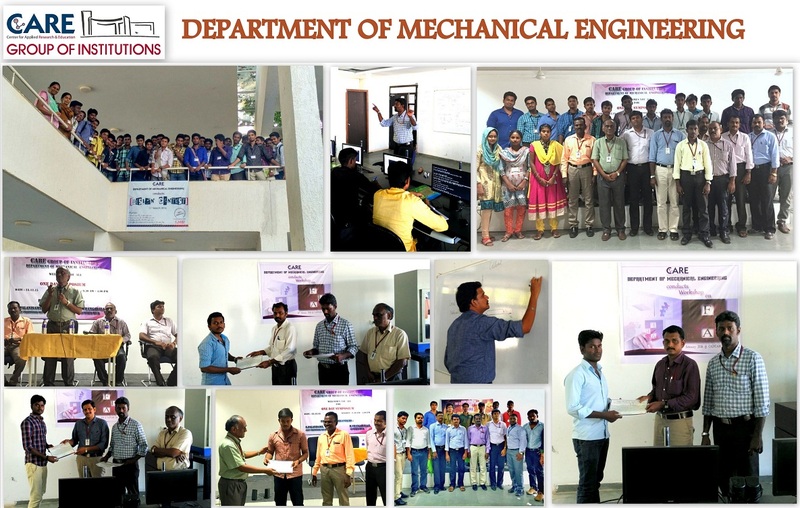 The students of the department are exposed to strong foundation in Core Mechanical Engineering subjects with practical knowledge, through various laboratory courses, internships, industrial visits and mini projects. The students are also exposed to the latest developments in the industry through guest lectures and seminars by eminent technocrats and academicians. Our Alumni have found employment with reputed core industries as well as MNCs.